The second-place team from Michigan State University (East Lansing) proposed an outdoor amphitheater surrounded by rain gardens in an area now occupied by surface parking. Photo courtesy of Michigan State University School of Planning, Design, and Construction. University students put their green infrastructure designs to the test for the U.S. Environmental Protection Agency Campus RainWorks Challenge. The challenge engages students and faculty members to reinvent water infrastructure and develop innovative green infrastructure systems to reduce stormwater pollution and build resilience to climate change. For the 2013 competition, the following winning teams developed designs in two categories for the challenge: a master plan entry examining how green infrastructure could be integrated into a broad area of a school’s campus, and a master design entry examining how green infrastructure could be integrated into a particular site on the team’s campus. 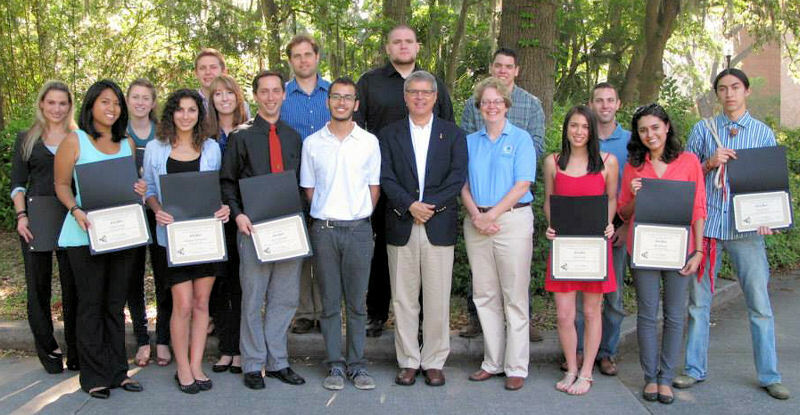 Nancy Stoner, U.S. Environmental Protection Agency (EPA) acting assistant administrator, presented certificates to the University of Florida (Gainesville) team that took first place in the Campus RainWorks Challenge Master Plan category. Photo courtesy of University of Florida College of Design, Construction, and Planning. University of Florida (Gainesville) won first place in the master plan category. The team’s design plan centers on a 27.4-ha (67.6-ac) subwatershed in the northeast corner of campus. To engage students with the journey of water, the three-phase plan would transform two detention facilities into campus amenities and redirect the flow of stormwater into above-ground pipes and vegetated bioswales. The winning team from Kansas State University (Manhattan) proposed a stormwater pocket garden in a high-traffic area in front of Hale Library. 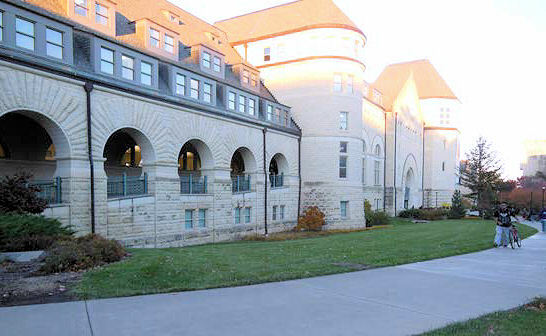 Photo courtesy of Kansas State University College of Architecture, Planning, and Design. Kansas State University (Manhattan) won first place in the site design category. 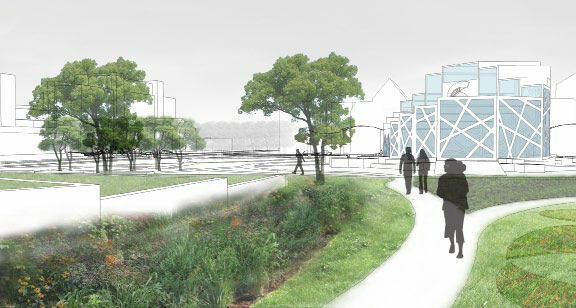 The team’s design calls for a stormwater pocket garden in a high-traffic area. It consists of disconnected downspouts, wet meadows, rain gardens, and stormwater runnels. The system is designed to retain all of the runoff from a 1-year storm. Michigan State University (East Lansing) won second place in the master plan category. The team’s design plan centers on a 6-ha (15-ac) area in the center of campus currently dedicated largely to surface parking. 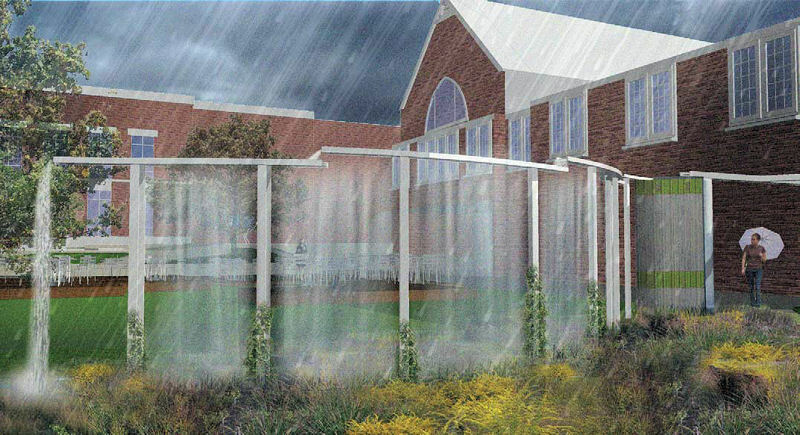 The team proposed the addition of several campus amenities with green infrastructure, including an outdoor amphitheater surrounded by rain gardens, a rain garden system in the shape of a Spartan shield, and a stormwater cistern with glass-viewing pyramids. The team’s plan would reduce runoff from the 10-year, 24-hour storm by 30% and would restore soils and native plant communities. The design proposed by the winning team from Mississippi State (Miss.) University included an aqueduct to convey water from a rainwater cistern to a bioretention basin. Photo courtesy of Landscape Architecture at Mississippi State University. Mississippi State (Miss.) University won second place in the site design category. The team’s design centers on the 0.5-ha (1.3-ac) Union Green. To create a multi-functional space that provides an educational experience, the team proposed a three-phase design. The first phase adds a 3785-L (1000-gal) aboveground cistern, an aqueduct, and bioretention to the west side of the site. The design would reduce peak flows for the 2-year, 24-hour storm to below predevelopment conditions. University of Texas at Austin and Purdue University (West Lafayette, Ind.) received honorable mentions in the master plan category. Kansas State University (Manhattan) and University of Maryland (College Park) received honorable mentions in the site design category.